Blog-tember Day 23: A guide to your city! Share some of the hot-spots and hidden gems of where you live. Athens, I love you. Oh, my beloved Classic City. There are some who wish to disregard our little town and compare it to Atlanta. They say there's nothing to do. They say that we're nothing without the university. But let me tell you, friends- Athens has heart. And there are so many wonderful things going on here. 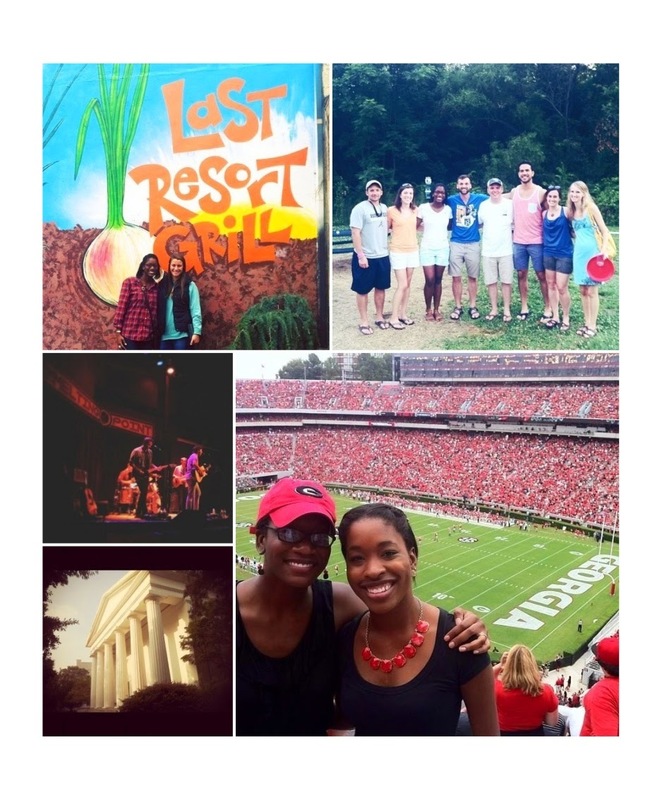 It is hard to narrow down the treasures of Athens to just ten things. Here you go, friends. 1. Go to a Georgia football game in Sanford Stadium. There's nothing like enjoying a football game between the hedges with 92,000 of your closest friends. 2. Eat well. Breakfast: Mama's Boy; lunch: Agua Linda, dinner: Last Resort Grill. 3. Take a walk on North Campus and ring the chapel bell. 4. Enjoy a run/walk/jog or a picnic at the State Botanical Gardens. 5. If you're there on Wednesday or Saturday, hit up the Athens Farmers Market. 6. Go paddleboarding on a Friday night at Sandy Creek Nature Center. 7. Enjoy a concert at one of Athens' amazing venues: Georgia Theatre, 40 Watt Club, or the Melting Point. 8. Just take a walk downtown and enjoy perusing the many shops and boutiques. 9. Take on a challenge and go on an adventure to find all of the bulldog statues in the city. There are over 34! 10. Take a tour of one of Athens breweries: Creature Comforts or Terrapin Brewing Co. My favorite is Creature Comforts. 11. And just one more for good measure- discover the quaint neighborhoods in Athens like Five Points and Normaltown- then find a spot to call your own.